Reliable quality backed by 65 years of iron casting expertise and originative skills of technology development. Annual productivity of 200 tons per capita and cutting-edge facilities that have assured ourselves as a small iron casting specialists. Two-day-off/week and two-shift/day work system that promotes ample creativity. The worksites where you can keep your white uniform clean and train younger generations to foster their happiness. 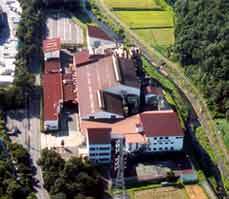 The accessible location at the central Japan with affluent nature.